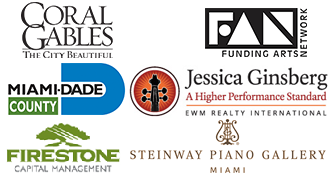 Friends of Chamber Music concerts take place at venues across Miami-Dade County. Please select from the following list to learn more about the venue and location. Located on the Coral Gables campus of the University of Miami, the Maurice Gusman Concert Hall houses a 600 seat concert hall, a professional recording studio, and the administrative offices of the School of Music. Click here for Google Maps directions to Gusman Concert Hall. The Coral Gables Congregational Church (CGCC) Community Arts Program (CAP) continues to more-deeply fulfill its mission statement: to serve a diverse community by offering educational and culturally-enriching experiences through the transforming power of the arts. Residents of and visitors to South Florida have come to recognize the CGCC Community Arts Program as a unique and valuable mix of exceptional cultural presentations, education, and outreach. Click here for Google Maps directions to the Coral Gables Congregational Church.